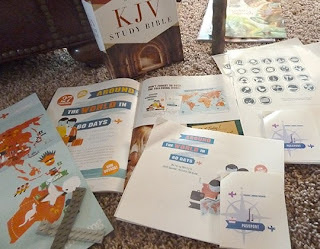 My kids and I just began a summer travel adventure around the WORLD!! All from the comfort and convenience of our living room! :-) When we recently sat down to read the latest issue of Focus on the Family's Clubhouse Jr. we discovered this neat summer idea already put together for us! Anyhoo, the idea is you read about different countries all around the world, a biblical application, activity idea and prayer for the people of that region. Then the kids can put the applicable stamp in their passport book. We printed out the travel guide and made each child their own passport. I printed the custom stamps on label paper, so they can really stick them in their booklet. 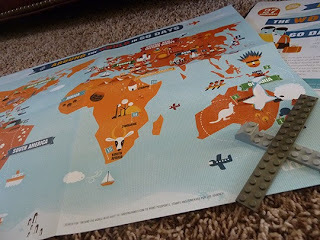 The kids first find the country and put their "plane" on it, then we read the very short "guide." Look up the Bible verse and do an activity. Then we find an actual travel video on YouTube so they can get a great idea of what the country is really like. Then we say a little prayer for the people in that country. (Also, since we started late, we're doing one country a day, instead of how they have it spread over two.) 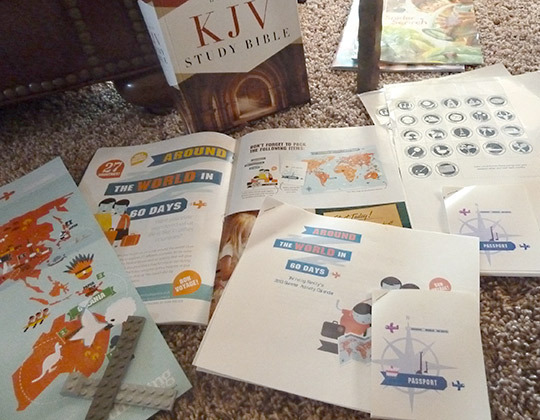 Visit the Thriving Family website to check it out and take your kids on a worldwide mission trip!